A delegation of the Joint Working Group (JWG) of Myanmar side is due to arrive in Dhaka on October 28 on a three-day official visit to Bangladesh. The delegation will include representatives from various ministries and Rakhine State government, according to the Ministry of Foreign Affairs in Dhaka. The Myanmar delegation is coming to Bangladesh to discuss ways for repatriation of displaced Rohingya people to their homes in Rakhine state. During the visit, the delegation will visit Rohingya camps in Cox’s Bazar to talk with Rohingya people for encouraging them to return to their homes, according to foreign ministry sources. Led by U Myint Thu, Permanent Secretary of the Ministry of Foreign Affairs of Myanmar, the delegation will join the third meeting of the JWG in Dhaka. Led by Myanmar Foreign Secretary Mint Thaw, the delegation will attend the third meeting of the JWG. The third JWG meeting will review progress in preparations for Rohingya repatriation, verification process, and measures taken by the Myanmar government to restore harmony among communities. Foreign Secretary Md Shahidul Haque and his Myanmar counterpart U Myint Thu will lead the respective sides in the meeting. Dhaka is likely to hand over a fresh list of Rohingya families to Myanmar side during the meeting, said a foreign ministry official. The Bangladesh side will also ask the Myanmar side to take initiatives to start repatriation at the earliest, the official said. The bilateral talks come as Dhaka mounts huge diplomatic efforts to find a permanent solution to the Rohingya issue and make Myanmar take back all of the displaced people to their homeland in Rakhine state, another official said. 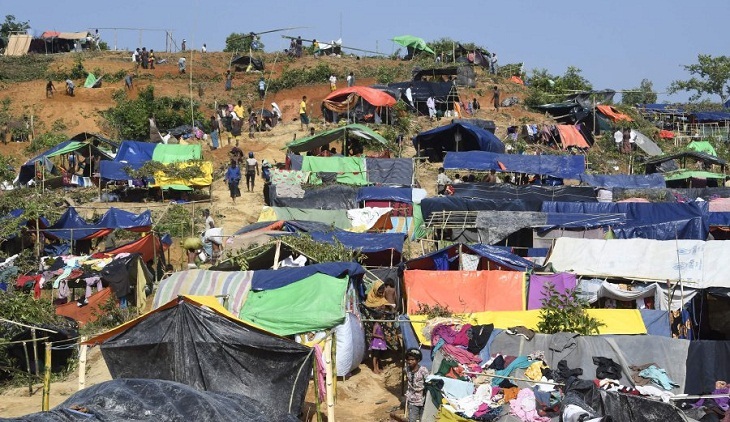 Refugees are gloomy about prospects of going back, fearing they will not be able to furnish the documents they anticipate Myanmar will demand to prove they have a right to return, the official said. Earlier, a delegation of the JWG led by the permanent secretary visited Dhaka to attend the second meeting of the JWG on Repatriation of Verified Displaced Persons in May. It may be recalled that Foreign Minister Abul Hasan Mahmood Ali, MP, visited the Rakhine state of Myanmar in August. He discussed issues related to repatriation of the forcibly displaced Myanmar nationals who took shelter in Bangladesh. During the four-day visit, he learnt about Myanmar’s preparation for repatriation of Rohingyas. The foreign minister was accompanied by Bangladesh members of the Joint Working Group on repatriation, including Foreign Secretary Md Shahidul Haque. The foreign minister had a meeting with U Kyaw Tint Swe, Union Minister of the Office of the State Counsellor of Myanmar, and paid a courtesy call on the Vice President of Myanmar U Myint Swe. During the visit, the Myanmar side informed that houses for the returnees are being built at selected locations and more will be built. They further informed that 42 sites have so far been identified for resettlement of the displaced people from Rakhine state sheltered in Bangladesh. The minister along with the JWG members of Bangladesh visited northern Rakhine State accompanied by the Minister for Social Welfare, Relief and Resettlement of Myanmar. He was taken to the border on the Myanmar side where a few thousands of displaced Myanmar nationals have been staying at the zero line. He also visited the reception centres at Taung Pyo Let Yar and Nga Khu Ya, the Transit camp at Hla Poe Kaung having 30,000 capacities, to demonstrate Myanmar’s preparations for receiving the returnees. Mahmood also visited Shwe Zar village where around 148 pre-fabricated houses for returnees are being built with the assistance of the Indian government.